Tennis elbow, some nuggets. – Pain. Health. Exercise. I believe many have heard of this term, “tennis elbow” and wondered why this condition is given such a sport-specific name despite the sport not being popular in every country. Why tennis? The origins of this condition (I believe) aroused from the number of people suffering from lateral elbow pain and/or forearm pain after playing too much racket sports, namely tennis. 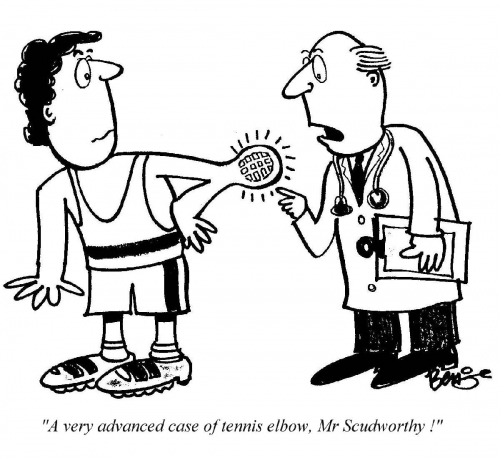 Up to 50% of all tennis players experience some type of elbow pain, with 75-80% of these elbow complaints linked to lateral elbow pain. The most common provocative activity is gripping. If you have lateral elbow pain with gripping, you may be suffering from tennis elbow. Often, twisting action like using a screw driver, turning a door knob or wringing dry a wet towel are painful too. But I don’t play tennis! The majority of patients that physiotherapists see are not involved in tennis. In fact, the large majority of them do not have a history of playing racket sports. However, many participate in occupations or activities that require repetitive use of their hands, like homemakers, electricians, butchers, kitchen helpers. It’s easy to tell from here that, many of these people’s livelihood are significantly affected! Rest usually help all repetitive strain conditions. However, in chronic lateral elbow pain, this does not seem true for all sufferers. Not everyone recovers with rest alone. Wait, this does not make sense. If the lateral elbow pain was aggravated by repetitive strain, shouldn’t rest alone help? Recent research regarding the underlying mechanisms that cause pain to persist in lateral elbow pain suggest that the nervous system (brain, spinal cord and peripheral nerves) has responded to repeated stress injuries, thus becoming more sensitive. Pain is the brain’s response and this pain gets triggered far more easily than how it should. What has been proven to work for me? Each individual in the groups were provided with information booklet outlining the disease process and practical advice of ergonomics. In this instance, ‘wait and see’ does not mean no treatment, as they have been through a professional consultation with specific advice given to self-manage. For more information regarding the treatment protocol, please refer to the research paper. Steroid injection helps to relief pain and is the best thing that has shown to work for you in 3 weeks. At 6 to 8 weeks, the effects of physiotherapy begin to match up to steroid injection. Both are still significantly superior to ‘wait & see’. Physiotherapy is much more effective that steroid injection in the long term. With results slightly better than just ‘wait and see‘. After just 6 weeks, the effects of steroid was lost and the rate of recurrence of people who had steroid injection was 74%! In fact, those who did not have any treatment were better than those who had steroid injection, which could suggest that steroid injection could delay recovery. In conclusion, we can safely say that steroid injection offers no benefit when used alone. Physiotherapy offers good short-mid term benefits and has been shown to maintain it’s effectiveness in the long term. Here is a useful podcast! What is the recurrence rates for physiotherapy then? 8% of people who completed physiotherapy suffer from recurrences, which is very much lower than those who had a steroid injection (74%). Even those who were assigned to ‘wait and see’ group had a similar rate of recurrence as those who had physiotherapy (9%). Therefore, in the large majority of people who completed physiotherapy, there is a very low recurrence rate. Rest doesn’t work for me in the short term. What can a doctor do to help it resolve faster? Steroid injections have been known to work very well in the short term (three weeks). However, as high as 74% suffer recurrence of the problem after 3 or 6 weeks as mentioned in the above research study. The best solution is to request for a referral to see an experienced physiotherapist who is equipped with skills to manage tennis elbow. What is the recommended treatment when I see a physiotherapist? The main tool that physiotherapists use is exercise prescription. However, physiotherapist rarely deliver treatment in isolation. In other words, they usually do not only perform one intervention alone. Tools physiotherapists use include taping, orthotics, manual therapy/manipulation, acupuncture/dry needling, shockwave therapy, laser, ultrasound, etc, depending on each individual’s training and how much they understand about the effectiveness behind each individual modality that may offer you relief. In the research study mentioned above, physiotherapy comprised 8 sessions x 30 minutes (within 6 weeks) of elbow manipulation and therapeutic exercise, with home exercise programme to be done independently. Physiotherapists who administered treatment in that research were postgraduate-qualified physiotherapists. This is a nice video of a patient who benefited from a similar exercise program. Conservative treatment require such a long duration to show a significant effect. If I can afford surgery, is it a better solution? Surgical management is usually not a first choice treatment for tennis elbow and a conservative route of treatment is usually recommended. To my understanding, there is insufficient evidence to either support or refute the effectiveness of surgery for tennis elbow. Please discuss with an orthopaedic surgeon regarding surgical options for tennis elbow pain. Bisset L, Vicenzino B (2015) Physiotherapy management of lateral epicondylalgia. Journal of Physiotherapy 61: 174–181. Coombes BK, Bisset L, Vicenzino B (2009). A new integrative model of lateral epicondylalgia. Br J Sports Med;43:252–258. Previous Post What should we do for Acute Low Back Pain?